So, today is a banner day. We visited the Italian Embassy today at our assigned appointment time with all of our documents including proof of purchase of property. There was a line but it moved pretty quickly. The nicely dressed agent examined all of our documents. The Embassy listed what we needed. BUT he asked for an additional form to prove health insurance. I had copied our information and had brought the book with all of our documents and copies with me so lucky for us we had that information too. TA DA! we have been approved for our 1 year Elective Visa. We go to pick it up next week. I am pretty psyched! Here is the receipt for my visa! 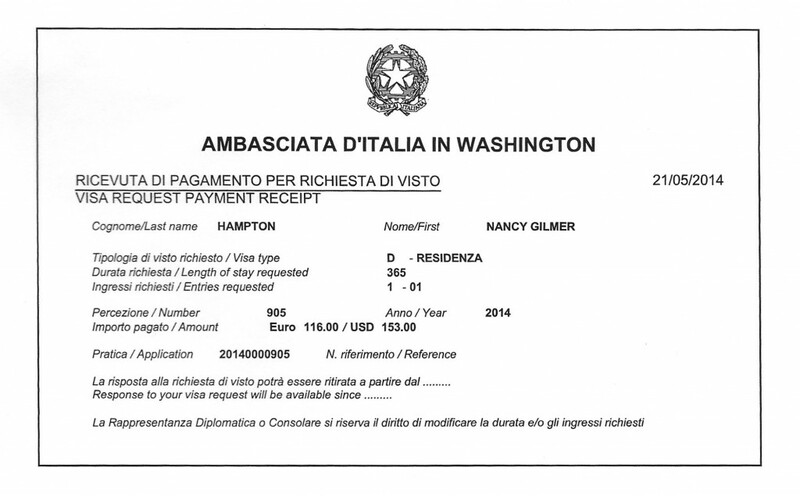 This entry was posted in Italian Visas, Uncategorized on May 21, 2014 by Nancy Hampton. Virginia house sold! Only 30 days to leave!!! The good news is the house sold. The bad news is that there is less than 30 days to closing! OH NO!! So much to do, so little time. I hit the ground running this morning and rented a storage unit for the things we are keeping here and arranged for the shipping containers to be delivered to the house for packing and sending over. UPakWeShip is the name of the company. I got them from a blogger who is based in Venice. They are very responsive so far. They do door to door shipping. It is just 100 square feet so not all that much can go. I am gathering it up and trying to prioritize what is most important. I also made plane reservations to depart from here June 24 for us and the two cats. That is a few days after closing on June 18. That will allow us to do some banking things and final issues. Next I have to do the buy back Renault car deal for a 3 month rental. It is the most economical way to go until we have our residency and can buy a car. Tomorrow we go to the Italian Embassy with our papers. Cross your fingers for us. We DO need that Visa! This entry was posted in Italian Visas, Real Estate on May 20, 2014 by Nancy Hampton. Hi everyone! Today I got a congratulatory email from our agent, Jim. He said we are now the owners of Via Grilli 5 in Umbertide Umbria, Italy! So excited. Right away I printed out the COMPRAVENDITA REPUBBLICA ITALIANA or the final sale agreement. I wish I could have attended the closing. I heard it is not to be missed. Lots of stamping, and reading out loud all the documents in both languages. Sounds very Italian to me! We have an appointment at the Italian Embassy next week on Wednesday where we will again present our documents, this time with the proof we own a home in Italy. After the sale we had our agent let the seller know we would buy 3 of her furniture items she offered for sale but at a much reduced price that she asked. We shall see if she accepts. If not we’ll just go to IKEA in Ancona. We would have to go there anyway to get many other items we will need. This entry was posted in Uncategorized on May 13, 2014 by Nancy Hampton. We just heard from our agent. Closing is set for May 13th. They will then send the ownership papers to us and we will schedule an appointment at the Italian embassy for our Visa. Getting closer! This entry was posted in Uncategorized on May 8, 2014 by Nancy Hampton.